Mosaic tiles are small tiles measuring 2-inches in size or smaller. They are normally held together in sheets measuring roughly 12-inches by either fiberglass mesh on the back, or brown craft paper on the front. Both types require some special installation instructions to ensure they look the way you intend them to. Face-mounted tiles which have a paper covering their fronts will require a few additional steps to install. Otherwise, both types of mosaic tile install similarly. Examine your mosaic tiles. If they appear to have a solid sheet of either brown craft paper or clear contact paper covering one side, they are face-mounted. The material that you can see is actually the back of the tile. To make sure that the tiles are exactly what you thought you were purchasing, soak a sponge in water and apply it to the corner of one of the sheets. The tiles will fall off the back and you can ensure they are what you ordered. Lay out your sheets of mosaic right on the floor where you plan to install them. Some mosaic patterns require that you install them in a specific order so they match up correctly. By laying out the sheets ahead of time, you can step back from the installation and ensure they are laid out correctly. Make sure as you lay out the sheets that each sheet is set apart from the others by the same width as a grout joint. Paper-faced mosaics should have a visible edge of tile around the perimeter of the paper. Use this edge to help you space the sheets correctly. Cut the mesh or paper between the tiles with scissors to help you fit them around the edges of the installation. 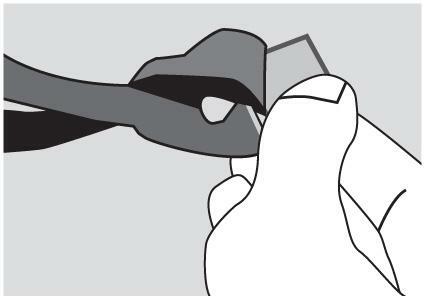 Cut the individual tiles themselves if needed with tile nippers. Double check all cut tiles with the others before installation to make sure they fit. Take up the sheets of mosaic from the floor and stack them nearby. Spread a small amount of thin set mortar onto the floor. Ideally you want to tile yourself backwards out of the room; start at the wall furthest from the door to help prevent walking on newly installed tiles. Key the mortar with the notches in the trowel to create grooves in the mortar, then turn the trowel and smooth out the notches with the flat edge. This will prevent the mortar from seeping up between the many small tiles and will eliminate the step of having to clean it out later. Spread a second layer of mortar onto the backs of the paper-faced mosaics if the sheet is made up of tiles that are different thicknesses. Press each sheet into the mortar in the same direction and pattern you determined earlier, smoothing each sheet down with your hand. Wiggle the sheets together until you cannot see where one sheet ends and the next begins. 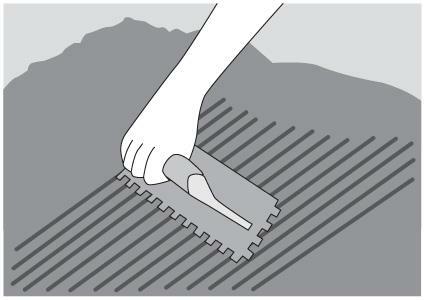 If you get the sheets too close together, use the edge of your trowel to separate them. Set a flat board down on top of the mosaics after installing a few sheets and beat it with a rubber mallet to drive the mosaics evenly into the mortar. Continue tiling until you work yourself backwards out of the room. Let the mortar dry for 1 hour, then remove the paper facing from the mosaics. Soak a sponge in water and wet down the paper on the mosaics until the glue releases. Peel the paper away. 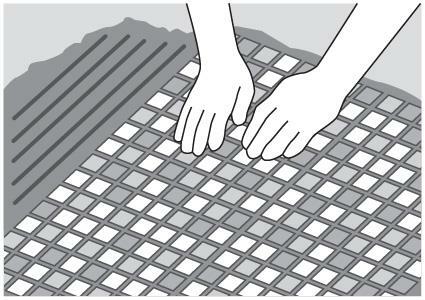 If a tile or two comes loose, push them back into place with your fingertips. Let the mortar dry for another 24 hours. Grout the mosaics by spreading grout over the entire installation with a grout float. Hold the float at a 45-degree angle to the mosaics to spread the mortar. Drag the mortar from several directions to ensure good coverage. 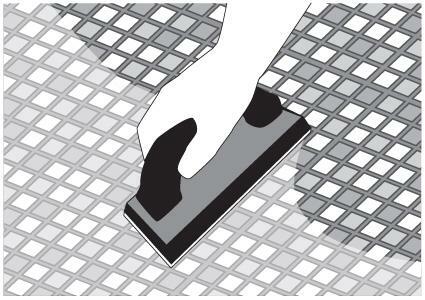 Let the grout dry for 10 minutes, then wash the surface of the tiles with a grout sponge. Wet the sponge lightly and work it in circles over the tiles until clean. Rinse the sponge frequently. Allow the grout to dry for an additional 24 hours. Mosaic tiles floors are a beautiful and timeless addition to any house. Take the time to install them properly and enjoy their beauty and what they bring to your home.